I've never understood why Shimano never sold a complete brakeshift cable kit. They make you buy everything separate. Probably just as well because when shopping for a complete kit I found this kit. It is really a complete kit. It comes with everything you will need to re-cable a bike including all of the small parts like ferules. And these are really good cables. Shifting is smooth and crisp. Braking is excellent. They breathe new life in an older bike. I change my cables about once a year (about 5k miles per year in a dry climate). Shifting is improved after cable replacement. Installation is fine, typical, I guess. All of the sheath-ends I need are present, and so are a few others, so I'm never quite sure I am using the best ones for particular sheath-ends. Don't have a problem with cable stretching. Over time, some of the coating on the cables (particularly near the front derailleur, rear brake) wears off, and some wear is evident for the cables inside the sheaths. Not sure how long cables should last, but I like starting the year with new cables, so these are OK with me. Haven't tried many, but I like these! I've only been cycling somewhat seriously for the last 3 and half years or so, and had been using the stock cables on my bike for about 2 years and 5,000-ish miles. So I don't have much experience with different types of cables. I had replaced the cables once on my previous bike, but that was a very cheap department store set, so obviously these are far and away better. Even with my inexperience, installation was relatively easy. I probably was off a bit on cutting the length of the housing at some points, but everything functions smoothly. I can't say for certain that shifting or braking performance has improved noticeably (besides the difference of swapping out new cables for old ones that were fraying causing mis-shifts), but everything is smooth and I like the look of the black housing and the cables. Have only done about 360 miles with them over the last couple months, but most of that has been cold, wet, and windy conditions. No issues so far and haven't had to make any adjustments yet due to cable stretch. It had been several years since I had my cables replaced at the local bike shop. I decided to do it myself this time and the improvement in shifting is amazing. The cables are top quality. Installation much easier than I expected. you don't get your moneys worth!! bought this kit and was excited to install. I used it on a cross bike and all was going well until I started to install the brake housing. As you may know on a disc break bike you need a lot more housing for the brakes. Well I expected to receive some spare housing, as most other companies due, but jagwire does not! they don.t even give you enough brake cable for the front break. The cable was way too short. so on top of what I already had spent i had to go to the bike shop and but some cheap housing. The front cable I had no used for as it was way too short. The product itself is generic nothing to boost over the performance i will see about. I have had it on my bike for a bout a month and it work. over all not impressed and will not purchase again. had they given me more housing and a longer brake cable for the front I would have been satisfied. If you are using it on a standard road bike the lengths are exact an you better not make any mistakes in the lengths you need as there is not room for error. Overall not impressed and would not recommend. if you are experimenting with switching your own housing this is not the kit to start with as it is very expensive!! Set up my cross bike with this cable set. It's high quality and easy to install. The cable ends are perfectly formed, no forcing the cable housing into the ferrule stops. The housing cuts so nicely - the reinforcement is stranded cable instead of a single helical band, so no filing to get a flat end. Just squeeze the cut housing back to round and jab an awl into the cut end to open the liner and it's ready. Much better than most other options. I used this product to replace worn brake and shift cables on my cx bike. It included everything I needed to do the job and good instructions. Both the shifting and braking were much improved after the installation. Great product at a great price. Easy to install and work with. Makes the old bike a pleasure to ride again. Replaced original shimano dura ace on 10 year old trek 5500. Feels like new but comparison is worn out crusted cables. Definitely needed it. Good cables at a good price. Nothing special, but a solid product for the money. Easy to install. My shifting feels so good, and light to the touch. There was very little slag after braking them in and the cables settled in fairly quick. I got them on sale and it was an awesome value. I've been using Shimano DuraAce shifter cables for years and they worked well. But the Jagwire kit provided a whole new smooth shift experience. It's awesome! I won't be going back to the Shimano cables/housings. Very nice. The cables are coated which is nice for the sections that is uncovered by the housing. Very high quality ferrils and end caps that come with this set. Never going back to Shimano for cables! Cheaper/better than Shimano, which still forces you to buy brake and shift cables separately. 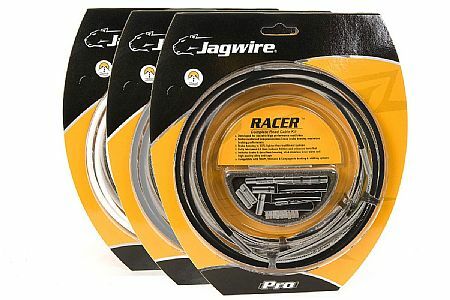 Why do that when JagWire is just as good if not better? All three of my road bikes have Jagwire cable kits installed. Durable smooth shifting. Performs and looks great. As a result good value. Normally you want something a bit less expnsive but when it's all said and done you get what you pay for. This set incudes everything. Thw quality and oerformance are excelant. This is by far the best deal for the DIY mechanics. It comes with everything you need. And it is pretty lightweight!